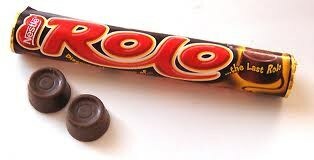 Rolo (pronounced "Row-low", referring to the roll-styled candy) is a brand of truncated-cone-shaped or frustum-shaped chocolates with a caramel centre, the shape resembling that of a shallow inverted bucket or tub or a traditional lampshade. They are made by Nestlé, except in the United States where production has been under licence by The Hershey Company since 1969. Of note, the caramel in the American variety is thick and chewy, rather than runny, as it is elsewhere.